Since March 2008, this site’s been visited by over half a million people who have read the 318 posts I’ve written. In that time, I’ve travelled the world talking to folks, I took a new job doing web things at a new University, got promoted to run the creative team here, and started my web consultancy with friends in the US and UK, Gas Mark 8. I’m even an adjunct professor now. How crazy is that. Sometimes work drags us all down and we’re all overworked and stressed out, but every once in a while, especially on a day like today, I step back, take stock, and reflect – something I’ve learned how to really do at a Jesuit institution. I get to do a creative job every day with an awesome team. I’ve got a lovely wife and two amazing boys. Sure, my basement floods and it gives me panic attacks, but overall, things are pretty awesome. 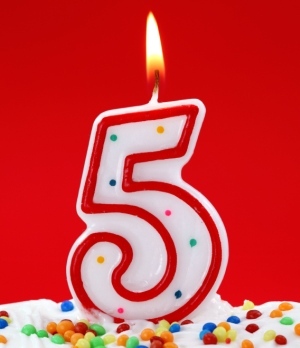 Thanks for reading, commenting, twittering me and more over the last five years. Here’s to five more.